When I was younger, I planned a long career of tilting at windmills. I went to class in order to sharpen my lance, to prepare for the great battles ahead. I dreamt of the day when me and my trusty partner would battle the machine and win — ensuring a better world for all people. 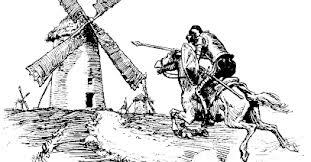 Especially the people who didn’t have the skill, strength, and courage to tilt at windmills. It’s 20 years later and my lance is hidden somewhere in my garage, covered with layers of dust and only slightly nicked by early battles that lacked conclusive victories. I still carry it around with me, from home to home, in the hopes that I might require it someday…kind of like my golf clubs and my woefully unused trombone. These items are symbols of a Wendy that once was full of passion and hope for a better future, who wanted to change the world. My trusty partner now lives almost 2000 miles away, and I don’t think he’s kept his lance sharp either. But I have another friend, a companion from those bygone days of lance sharpening, who is still fascinated by the battle. He recently reminded me of my old dreams, and suggested that perhaps it was time to dust off the armor, sharpen the lance, and ride out into the brave new world to find a windmill. It’s a pretty compelling argument. There are more windmills that ever, and we tilters could use the help.